Toon's Tunes : September Mourning, at #Aftershock too... name these musicians! September Mourning, at #Aftershock too... name these musicians! Blending music with a comic book story, September Mourning, on stage at Aftershock, at Gibson Ranch Park, Elverta near Sacramento. I'm trying my best not to compare September with Maria Brink of In This Moment. If you love In This Moment, you'd either love September Mourning, too, or you'll be tempted to dismiss them as wannabes. Don't do that: take a listen, make up your own mind. They are not the same, and September is not trying to be another Maria. All the band members have character names: September (vocals), Riven (guitar, Rich Juzwick), Wraith (guitar), Rasper (?? ), Shadou (bass), Stitch (drums). I'd love to tag the photos with the right character AND musician's names, so if you can help... I know Rich Juzwick from his Gemini Syndrome days, but the band's Facebook only lists character names, Wikipedia doesn't have everyone, and there seems to have been a lot of band member turnover. So please forgive any mistakes, we tried!!! 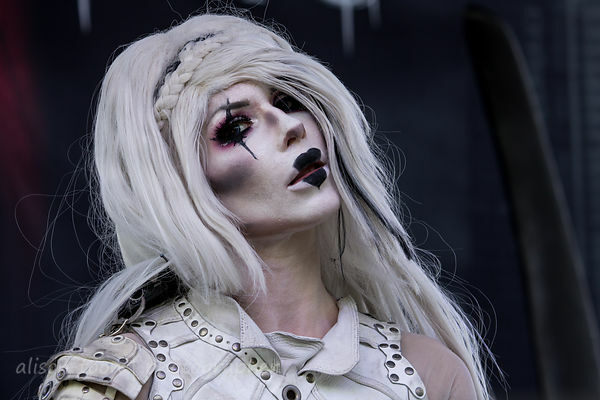 Take a look at the full September Mourning photo gallery by clicking right here! Still more photos to edit from Aftershock: if you want to be notified, follow @alisontoon on Twitter, or like the Toon's Tune/Cameras and Cargos Facebook page.